Among the sites few tourists to Russia hope to see is the inside of a local hospital, but should such a visit be necessary, it isn’t something to fear. 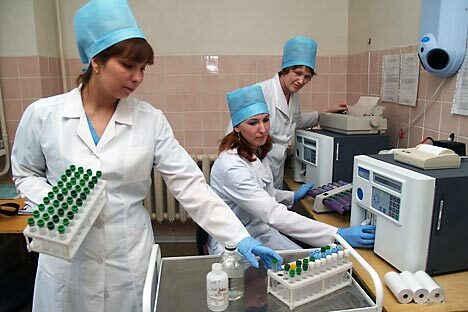 Prior to a trip to Ulan-Ude City Hospital, I had only ever been to a Russian hospital for blood tests. All foreigners staying in the country for an extended period of time have to be tested to prove they are not infected with horrible diseases such as AIDS and tuberculosis. This seems rather pointless because, in order to actually get a visa, the unfortunate foreigner has to have the same tests at home. It seems, once the test has been done and the visa obtained, at some point during the flight to Russia the results become invalid. Arguing with Russian nurses that this seems counter-intuitive produces only a stern silence and the needle goes in anyway. It was, therefore, with some trepidation that my friend Juliet and I decided that we had to take a detour from our Trans-Siberian journey to visit the local clinic. She had arrived in Russia from the UK already with chemical burns on her foot, and now it had become rather swollen. By the time we reached Ulan-Ude her foot was looking less like a foot and more like a football. In an attempt to avoid going to the actual hospital, we first attempted to get her treated at a clinic around the corner from our hostel. Unfortunately, it was a gynaecological clinic, and the doctors refused to look at Juliet’s foot, as it was outside their realm of expertise. So off to the hospital we went. For those of you with the misfortune to need the services of Ulan-Ude’s City Hospital, fear not. It is set in pretty grounds a short tram ride from the center of the city. It was not your typical Western hospital experience, but the doctors there were helpful – if not particularly friendly – and everything was clean. Upon entering the clinic room, three doctors descended upon us. They rapidly decided the problem was an infection in the foot, and then decided that it would be best to cut a hole and insert a small piece of rubber to act as a drain. Neither Juliet nor I were particularly pleased with this suggested course of treatment. Nevertheless, despite the pain and the medical language barrier, we managed to communicate with exaggerated hand signals: at one memorable point I pointed to Juliet, pointed to the floor and then slapped my hand. Smelling salts were duly produced to stop her fainting. A short while later she was issued a prescription and we were on our way – we did not even have to pay. There are horror stories aplenty about the Russian health service but in Ulan-Ude they did a good job and tried their best. Perhaps it depends on luck, but the people in the City Hospital were helpful; they did not make us wait; and sent Juliet on her way with a foot that was in considerably better condition than it was when we arrived. Juliet and I went to a fusion restaurant named after Genghis Khan recommended in a guide book to celebrate the renewed use of her limb. We had the most hideous (and expensive) meal of our trip and were sent a bottle of Soviet Champagne from a nearby table. At the end of the meal, a man from the table behind us jumped up – the mysterious Champagne sender – and insisted on paying for our dinner even though we had not spoken two words to him. There is never a dull day in Russia.